San it’s triathlon coach for over 10 years, co-founder of CMTeam, a company that provides and guides personalized training programs to enhance athletes performance. Coach of the PRO triathlete Carla Moreno, a Brazilian athlete who has won several distance triathlon races; also coaches Brazilian and international athletes in more then 20 countries. National head coach in many competitions such as ITU WC and WTS Series in four continents, Pan-American Games (2007), IM and IM 70.3 races. San has been a triathlon coach for over 10 years. He is also the co-founder of CM Team, a company that provides and guides personalized training programs to enhance athletes performance. 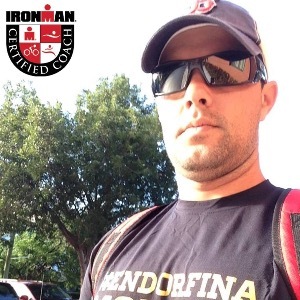 San holds a bachelor degree in Physical Education/Sports and IRONMAN Certified Coach. He has been coaching the professional triathlete Carla Moreno, an elite Brazilian athlete who won several different distance triathlon races. San Palma also coaches Brazilian and international athletes at all levels of ability in more then 20 countries. He was the coach and the national head coach in many competitions such as ITU World Cup Series, ITU Triathlon World Championship in four continents, Pan-American Games (Rio 2007), Ironman World Championship and Iroman 70.3 World Championships. During the 2010 Budapest ITU Triathlon World Championship and 2011 Beijing ITU Triathlon World Championship, he was the national head coach of Brazil. In addition to those responsibilities, he was also one of the board directors of Brazilian National Triathlon Federation, being the Director of Materials and Technology. He also has experience in running and managing triathlon camps in Europe, Oceania, North and South America. Success. Coach San Palma has been notified of your message.